So, what hasn't featured on this blogspot yet is the secret youth squad Phil and I have been holding back ready to unleash on some more pots. 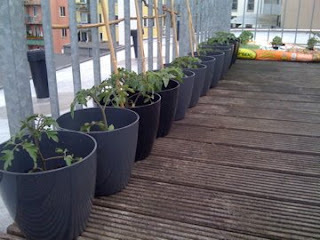 We now have 12, repeat 12, pots and 6 tomato plants in a grow bag. Needless to say things are getting a little out of hand... I hope everyone likes tomato soup! Why did this happen? Well, I was loathe to throw so many good plants away, and as they'd done so well in their little greenhouse I thought they deserved a chance in life.